Vera Brittain and the First World War by Mark Bostridge was published in 2014 and it’s subtitled The Story of Testament of Youth. The author is quite an authority on Vera Brittain as he has written a biography of her and in the past has worked as an assistant to her daughter Shirley Williams. I read Testament of Youth years ago, probably around about the time that the BBC dramatised the book in 1979, but I didn’t watch the more recent film because I didn’t see how it could possibly do the book justice in such a short time. The BBC serial is very good but I suppose it might seem a bit dated now, acting styles do change over the years. I think that some people might be a bit disappointed by this book as it is an honest portrait of Vera’s life which if you have only read Testament of Youth might come as a bit of a shock. She did have a habit of re-writing history to put herself in a better light, or to make herself seem hard done by within her family. The fact is that her brother Edward hadn’t intended to join up straight from school but Vera who was by this time 20 years old seems to have been so influenced by the jingoism of the newspapers and some politicians that she persuaded him to enlist – her argument seems to have been that people of their class should be patriotic. Their parents were completely against their only son joining up and Vera was such a snob that she told her father that that was his attitude because he hadn’t gone to a public (posh private) school and therefore wasn’t as patriotic. I think she was one step away from being one of those dreadful females who handed out white feathers to men. Edward seems to have quickly regretted his decision to join up when the reality of the trenches hit him. It’s easy to see why Vera re-wrote history as she should have been consumed with guilt. Much was made by Vera of her difficulty in getting a university education, claiming that her parents were against the idea when in fact she was encouraged to go to Oxford and was financed by them. Perhaps she only wanted to make her story seem more interesting but it had the effect of putting her parents unfairly in a bad light again. At Oxford she had her apparently usual reputation for being earnest and conceited and also had no sense of humour, something that was a drawback when the book was being turned into a TV series, but she did make some friends there before she decided to become a VAD nurse and do her bit in the war. Her experiences eventually led to her writing her famous book, aided by some diaries that she had written in the first years of the war. It might sound like I’m being a moaning Minnie – I’m not, it’s just that Vera was quite a flawed human being, she was a feminist but a terrific snob, the sort of woman for whom women’s rights were only for upper class women, certainly not for her own servants. This book also gives some information on the making of the film and BBC series and also of Virago reprinting the book which led to them. There are also quite a few interesting photographs. The author does seem to have got to the bottom of the strange circumstances of Edward Brittain’s death at the front. This was an interesting read with Vera in reality travelling from jingoistic euphoria at the outbreak of the war to pacifism a few years later. In recent years we’ve become used to hearing about what women did in wartime and I have tended to have taken for granted that women’s contributions had always been appreciated, so I was really surprised to read in this book that in the BBC documentary The Great War (made to commemorate the 50th anniversary) which has a total running time of over 17 hours only minutes were devoted to recounting women’s experiences. I’ve watched that whole series at least three times, and that had never dawned on me! This book is a good read. The Vet’s Daughter was first published in 1959 but I read a Virago reprint. It’s the third book that I’ve read by Comyns and I think that it is the one that I’ve liked least, although it seems to have been seen as something of a wonder when it first came out. It was apparently received with excitement, widely reviewed, praised by Graham Greene, reprinted, made into a play, serialised by the BBC and adapted as a musical. It didn’t really appeal to me because I found it to be too dark and quite depressing. The story is told by Alice, the vet’s daughter, she lives with her parents in a poor part of London and her father is abusive, especially towards his wife. It’s a bit of a puzzle as to why he’s a vet as he has no love for animals, the vivisectionist arrives weekly to collect the unwanted puppies! Alice is just a drudge, having to clean out all the animal cages and run the house. Things just get worse as Alice’s mother suffers a lingering death, getting no sympathy from her husband. He wastes no time in moving the local barmaid/tart into the house when his wife dies and so begins another round of misery for Alice as she has to clean up after the tart and her father’s moods are no better, he’s still a raging drunk who enjoys beating up his daughter. There’s a brief respite for Alice when she moves away to the countryside to be a companion to an old lady, the mother of her father’s assistant. But that ends in tragedy too. Comyns has a thing about floating, I seem to remember that in Sisters by a River there was one of them who often seemed to float upstairs, or so she thought anyway. Something similar happens in this book too, but it has dire consequences. I found it to be an odd book. It happens to have been ‘born’ the same year that I was born and back then it may have been seen as quite fantastical which might account for it being so well received, but for me it just seemed a bit of a downer. 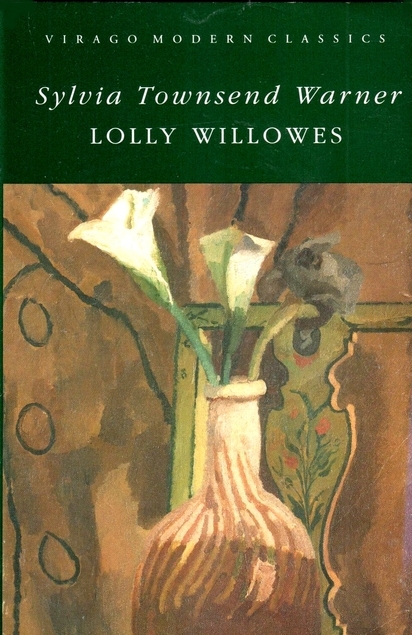 Lolly Willowes by Sylvia Townsend Warner is one of a bunch of Virago books which have been languishing unread on a shelf for years, so when I saw that quite a few bloggers seemed to have read it recently I thought I should get around to it too. I have to say that I didn’t love this book as much as I had expected to. It’s a book of two halves really. When her father dies Lolly Willowes has to move in with her brother and his wife and their family. She has been left money of her own but nobody expects her to strike out on her own and have an independent life. She’s one of those maiden aunts, handy for when the children need to be looked after, but otherwise unwanted. After years of living her life to suit other people she eventually decides to move out to Great Mop, a rural village, where she’s able to learn more about nature and the plants and potions that have always attracted her. The book changes completely, just as Lolly did, and it seemed apt that I got to this point in the book on Halloween, as the village turns out to be full of witches. You might be interested in reading this Guardian article about Sylvia Townsend Warner: the neglected writer. It’s just as well that I keep a written list of all the books which I’ve read and add to it as soon as I’ve finished a book, in fact I write the title down first and add the author when I’ve finished it, all written in pencil in an old school jotter, very low tech. But that low tech list is more precise than my Goodreads list because I just discovered tonight that I hadn’t added all the books that I had finished recently on to Goodreads, which meant that I had actually reached my goal of 75 books read – four books before Goodreads thought I had. 1. Traitor’s Purse by Margery Allingham – I’ve already blogged about that one. So what did I think about Mrs Palfrey at the Claremont? It must be a couple of weeks since I finished reading it now but it’s still very clear in my mind, and I can’t always say the same of a fair few books, although when I read the blurb the details usually all come back to me. I’ve really liked Elizabeth Taylor’s books in the past and I wasn’t disappointed with this one although I did find the subject matter to be quite sad. The Claremont Hotel is situated in London and most of the guests are elderly people who have decided to stay there because they aren’t really up to looking after themselves in a home of their own, but obviously don’t want to take the enormous step of checking themselves into an old folks home. They hope that London will have more to offer them in the way of entertainment compared with some more traditional retirement locations such as coastal resorts like Bournemouth. But the Claremont is peopled by an odd assortment of inhabitants, widows and widowers who were all fairly recognisable characters to me, Taylor is very good at observation of people and the emotions which rule them. Of course despite the many free attractions on offer in London none of them take the opportunities to visit them, and each day is much the same as the one before. The meals on offer in the hotel are repetitive, on a strict rotation of the – if it’s Tuesday it must be veal – variety. Boredom is the one thing that the guests all have in common, but being seen as an object of pity by the other guests is what Mrs Palfrey really wants to avoid. It’s what they all want to avoid but as they’re stuck in an environment where the most exciting thing that happens is recognising one of the previous guest’s name in the obituary section in The Times, there’s not much hope for any of them. This book was first published in 1971 when Elizabeth Taylor would have been 59, so she wasn’t in her dotage, but obviously had some experience of people who had lived out their final days in small hotels like The Claremont. This is a really well written book but as I said – I did find the subject sad and it made me all the more determined that if I ever reach a great age – when my time comes – I’ll bow out gracefully thanks!